Rustic Style Bluish Green Metal Vase Display home decor in a charming way. you will find that it bring your home more special, Elegant ,chic and Vintage. Making a fine addition to your gardening kit, this metal can brings together versatility and durability. The metal jug flaunts a classic-style design and is decorated with a rustic style finish for added visual appeal. 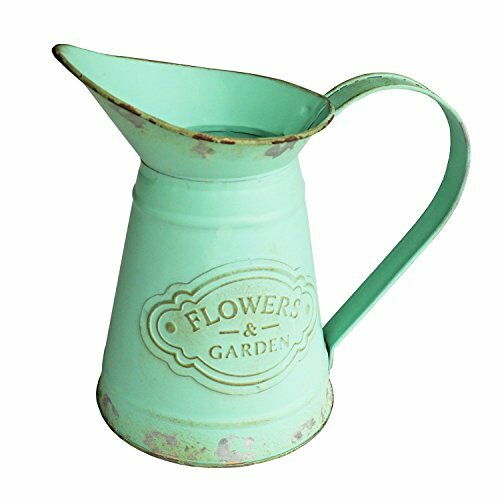 Material: Thickened Metal, Durable; Height:7"; Mouth length:5"; Pitcher opening: 2.6"; Base Diameter:4.7"
Display home decor in a charming and vintage Parisian way with this French design rustic metal pitcher vase.